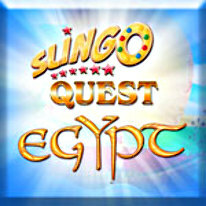 Slingo Quest Egypt is the latest adventure in the award-winning Slingo Quest series. It features a brand new…oh no, wait, that darn Devil just stole the best level in the game! It’s up to you to join the Slingo Cherubs on an exciting quest to steal it back. Along the way you’ll meet a number of new Slingo Friends, each with a different Slingtastic power to share. Discover fun new power-ups! Uncover innovative new game modes! Beat the Devil at his own new mini-games! Can your team journey through the fabulous lands of Egypt, and win the Joker's game back from the Devil?